This Mosaic quilt block is a version of the Disappearing Nine Patch, designed for hand piecers (although you may choose to sew by machine as well). You will get the same effect, but there are just more and smaller cut pieces. However, since all pieces are either squares or rectangles, the block is quick and easy to construct. 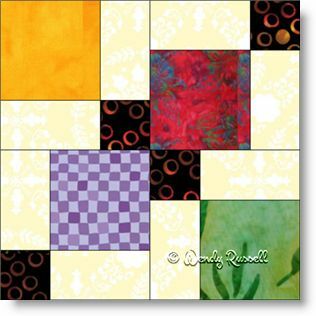 This four patch quilt block is generally designed with a "scrappy" quilt as the end product. Depending on how you lay out the blocks, you can design all sorts of interesting quilts.